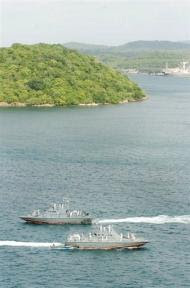 Sri Lankan navy boats patrolling the waters off the eastern port of Trincomalee in September 2007. The note contains a number of press reports many of which were just released about 4 hours ago on the most serious marine warfare incident in Mullaitivu, 40 kms. from Indian coastline (Point Calimere or Kodiakkarai). 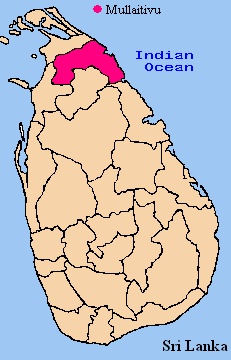 Mullaitivu island is located between Jaffna and Trincomalee. A serious naval sea-mine warfare incident has occurred very close to the coastline of India in Mullaitivu (located between Jaffna and Trincomalee), just 40 kms. from Point Calimere (Kodiakkarai) of Indian coastline. A naval craft of Sri Lanka has been blasted by a Sea Mine planted by LTTE Sea Tigers. This has confirmed the worst fears of security analysts and the issues of national security brought to the notice of the Hon'ble Supreme Court on the Rama Setu protection case and to the Govt. of India. We call uponn the Government of India to take serious note of this incident and immediately suspend the Setusamudram project and order a detailed security evaluation. It should be noted that when after operation Desert Storm, it was found that sea-mines in a short stretch of only 20 kms. in the Persian Gulf had to be cleared, it took the combined efforts of US, Australian, German, British, Netherlands navies about 6 months to complete the mine sweeping and mine hunting operations and declare the Gulf safe for navigation. One can only imagine the consequences of such mine-warfare in the Setusamudram narrow mid-ocean channel of over 160 kms. and the enormous burden it will impose on the Indian security, military and naval forces to keep the channel passage open and operational. This incident also confirms the concerns expressed recently by Admiral Mehta and Director General of Coast Guard Russy F. Contractor on the security implications created by the proposed mid-ocean channel project in Setusamudram.. Such mine warfare incidents proving the asymmetric mine warfare capabilities of LTTE will result in steep and immediate escalation of freight insurance costs, necessitating a review of all navigation projects in the region. Tamil Tiger rebels struck back against a mounting Sri Lankan military offensive on Saturday by sinking a naval fast attack craft, leaving 10 sailors missing, officials said. A navy craft was destroyed in a "mystery blast" caused by the Liberation Tigers of Tamil Eelam (LTTE), the defence ministry said, adding that the guerrillas appeared to have developed new underwater capabilities. "The navy suspects the blast was caused by a possible sea mine or due to some underwater weapon" developed by the rebels, the ministry said, adding that there was no sea battle or any guerrilla craft in sight during the sinking. The military retaliated with combined land-air attacks against suspected Tiger positions, capturing some land in Mannar district, while ground troops killed 15 rebels, the defence ministry said, adding that two soldiers also died. There was no immediate word from the rebels about the land offensive. But the LTTE said they sank the navy craft by using three suicide bombers in the pre-dawn attack in high seas off rebel-held Mullaitivu district. Six sailors from the locally made Dvora-class fast attack craft were rescued by another boat patrolling off Mullaitivu where the Tigers have their main military bases, navy spokesman D.K.P. Dassanayake said. Ten more were missing after the blast. 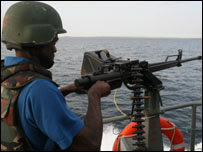 "The officer in charge and five others from the FAC (fast attack craft) were rescued," Dassanayake said. "One of them said the craft started taking on water after a huge explosion. They got into a liferaft." The pro-rebel Tamilnet.com website reported the navy craft was sunk in a suicide attack launched by three "Black Sea Tigers," or suicide bombers. The Tamil Tigers are known for their trademark suicide bombings and have been outlawed as a "terrorist" outfit by the United States since October 1997. The sinking of the navy boat came hours after a military bus was hit by a landmine in the district of Mannar on Friday night, leaving at least two soldiers dead and six wounded, the military said. The government claims it has killed 2,257 rebels since January against the loss of 133 of its own troops. The government allows no journalists or rights groups into the embattled regions, making it impossible to verify the figures. However, troops have made little progress in taking rebel territory in the island's north, military sources said. The military has pushed out the LTTE from its last bastion in the east of the tropical island, a victory that has largely confined the rebels to their northern mini-state. The rebels have been battling for an independent homeland since 1972 in an ethnic conflict that has claimed tens of thousands of lives. Ten crew from a Sri Lankan patrol boat are missing after their vessel exploded and sank off the island's north-east coast early on Saturday. The Sri Lankan navy said the boat, carrying 16 crew in all, was thought to have struck a sea mine planted by Tamil Tiger guerrillas. But the rebels said the vessel had been attacked and destroyed by one of their suicide squads. This is the second naval vessel sunk since a ceasefire ended in January. The BBC's Roland Buerk in Colombo says two navy fast attack craft, about 25 metres (82ft) long and armed with heavy and light machine guns, were on a routine patrol when one was caught up in an explosion and sank. The incident took place near Nayaru, 300km (185 miles) north of Colombo. Five crewmen and an officer were rescued. A spokesman for the Sri Lankan navy, Lt Commander Rohan Joseph, denied reports on a pro-rebel news website that the patrol had been attacked by the Black Sea Tigers suicide squad. Five seamen were lost in the earlier incident in February. In January the government pulled out of a formal commitment to a 2002 ceasefire with the Tamil Tigers, arguing the rebels had used it to re-group and re-arm. Since then, fighting has intensified on the frontlines that surround Tiger-held territory in the north. The Tigers have been fighting for an independent state in the north and east since 1983. More than 70,000 people have been killed since then. They say that ethnic minority Tamils have been marginalised for decades by governments dominated by the Sinhalese majority. COLOMBO, Sri Lanka—A Sri Lankan navy boat sank after apparently hitting a floating mine off the island's northern coast in an incident that left 10 sailors missing early Saturday, an official said. 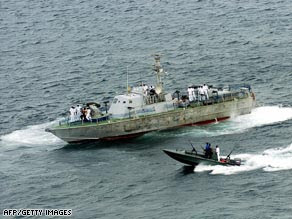 A Web site linked to the Tamil Tiger rebels said, however, that the navy boat was hit by a rebel suicide attack. The incident occurred as intensified fighting raged between Sri Lankan troops and ethnic Tamil rebels elsewhere on the island. Navy spokesman D.K.P. Dassanayake said he believed that rebels planted the mine at sea off northern Mullaitivu district. Six sailors were rescued but 10 others who were on the boat were missing, Dassanayake said. The pro-rebel Web site TamilNet said, however, that the insurgents launched a suicide attack on the boat and that three of its fighters were killed. The Tamil Tigers, who have been fighting for an independent state for the country's minority ethnic Tamils since 1983, run a strong naval force. The rebels' suicide attackers often ram boats packed with explosives into government naval ships. Meanwhile, the military said ground troops captured a crucial area in northern Mannar district Saturday. Military spokesman Brig. Udaya Nanayakkara said holding the territory, though it is only about half a square mile in size, was important to reducing the rebels' ability to fire artillery and resupply their front lines. On Friday night two soldiers were killed and six others were wounded when a mine planted by the rebels hit their bus in Mannar town, Nanayakkara said. Rebel spokesman Rasiah Ilanthirayan could not be contacted for comment. Both sides often exaggerate their enemies' casualties and underreport their own. More than 70,000 people have been killed in Sri Lanka's violence, which originated from ethnic Tamils being marginalized for decades by a series of governments run by majority ethnic Sinhalese. COLOMBO, Sri Lanka (CNN) -- Ten Sri Lankan sailors were missing after a Navy boat suddenly burst into flames and sank off the rebel-held northeastern Sri Lankan coast early Saturday, Navy sources said. Six sailors, including the commander, were rescued after the Fast Attack Craft sank, the sources said. A search was under way Saturday for the 10 missing sailors, they said. The sinking happened just after 2 a.m. in the high seas off the coast from Mullaitibu, a coastal village in the northeastern Sri Lankan region controlled by the Tamil Tiger rebel movement, the Navy sources said. The sources said it was not immediately known what caused the boat to catch fire and sink. None of the survivors and no one on another Navy boat that was nearby heard or saw anything that would explain it, the sources said. However, The Associated Press reported that Navy spokesman D.K.P. Dassanayake said he believed that rebels had planted a mine at sea. The fighting in Sri Lanka pits government forces in a country dominated by the Sinhalese ethnic group against rebels from the Tamil minority. The rebels are fighting for the creation of an independent nation, citing discrimination by the Sinhalese. COLOMBO, Sri Lanka: A Sri Lankan navy boat sank after apparently hitting a floating mine off the island's northern coast, leaving 10 sailors missing early Saturday, an official said. However, a Web site linked to the Tamil Tiger rebels said the navy boat was actually hit by a suicide attack. Pro-rebel Web site http://www.tamilnet.com said, however, that the insurgents launched a suicide attack on the boat, and that three of its fighters were also killed. The Tamil Tigers, who have been fighting for an independent state for the country's ethnic minority Tamils since 1983, run a strong naval force. The rebels' suicide attackers often ram boats packed with explosives into government naval ships. Military spokesman Brig. Udaya Nanayakkara said holding the territory, though it is only about a square kilometer (0.4 square mile), is important to reduce the rebels' capacity to fire artillery and resupply their front lines. Both sides often exaggerates their enemies casualties and underreport their own. COLOMBO, March 22 (Reuters) - Sri Lankan air force jets bombed rebel Tamil Tiger ground positions on Saturday after a navy patrol boat was sunk by a suspected rebel mine off the northeast coast, with 10 of the 16 crew missing and feared dead. Pro-Tamil sources said the Dvora fast attack boat was destroyed by a suicide squad of so-called black Tiger fighters, with three rebels killed in the sea clash. But the military said the boat struck a mine during an early morning patrol by two navy craft in darkness near Nayaru area, around 300 kms (185 miles) north of the capital Colombo. "We suspect it was an LTTE (Liberation Tigers of Tamil Eelam) sea mine," navy spokesman Commander D.K.P Dassanayake told Reuters, saying the explosion happened around 2am. "The commander of the boat said it was raining and he heard an explosion, so we suspect it's a sea mine explosion as there were no LTTE boats around that time and there wasn't any confrontation," Dassanayake said. The pro-Tiger website www.tamilnet.com said rebel suicide fighters destroyed the boat during a firefight that lasted up to 45 minutes, claiming 14 sailors were killed. "Elite Black Sea Tigers, engaged in a confrontation with a fleet of the Sri Lanka Navy in the seas off Mullaiththeevu, attacked and sunk a Dvora Fast Attack Craft," the Web site said, citing Tiger sources in Vanni. Both sides regularly make conflicting claims. Their reports are impossible to verify since Nordic peace monitors who had been keeping watch over a shaky ceasefire left the island this year. They left after President Mahinda Rajapaksa formally scrapped a six-year truce in the country's 25-year civil war in January, accusing the rebels of using the peace to rearm. The navy ship was the second sunk by suspected Tigers since then. The military has been intensifying its campaign against the Tigers, who are fighting for an independent homeland, pressing forward in their northern strongholds and aiming to defeat them by year's end. But in a separate incident, two government soldiers were killed and six others injured when their bus hit a Tiger landmine in the northwestern district of Mannar late Friday. It was unclear if any Tiger fighters were killed, said Air Force spokesman Wing Commander Andrew Wijesuriya. The military said they had also overrun Tiger positions near Parayanakulam, also in Mannar, killing 15 rebels for the loss of 2 government soldiers in a strategically vital area. That bought the death toll in fighting this week to 158 rebels and seven soldiers. A search was still underway for the 10 crew missing from the navy attack craft. The Tigers have hit back against the military offensive with regular attacks increasingly aimed at civilians and often using roadside bombs. An estimated 70,000 people have died since the war began in 1983. COLOMBO, March 22 (Xinhua) -- The Sri Lankan Airforce here Saturday claimed a Tamil Tiger rebel radar station in the island's north was bombed and destroyed in an air strike. Wing Commander Andy Wijesuriya, the Airforce spokesman said the air raids were carried out at 11 a.m. local time (0530 GMT) at Nayaru 300 kms northeast of Colombo. In the second air raid which took place at 2.10 p.m local time (0840 GMT) a Liberation Tigers of Tamil Eelam (LTTE) sea Tiger wing co-ordinating center located at Puthukudyiruppu in the Mullaithivu district was destroyed, the Airforce said. The air raids came as a Sri Lankan Navy fast attack craft was destroyed in the early hours of Saturday in a sea mine explosion at Nayaru. The explosion happened around 2 a.m. local time (2030 GMT). The Navy said six out of the 16 on board had survived the explosion while it had launched a search operation to find and rescue the rest of the sailors. The LTTE rebels claimed that the Navy attack craft was destroyed by them where they lost three of their Black sea Tigers. However the Navy rejected the rebel claim stating that there was no confrontation whatsoever in the areas. The clashes are part of the ongoing military action in the north of the island in the separatist war waged by the LTTE rebels on behalf of the Tamil minority. 2. " Mine Threat: The prevailing depths in the SSCP make it an ideal area for the use of sea mines. It has already been highlighted about the acquisition of sophisticated conventional arms by various terrorist organizations. A rudimentary sea mine is far cheaper than any of the sophisticated missiles. And yet, the mines can block the channel from being used for protracted durations as Mine Countermeasures (MCM) is a slow, tedious and time consuming form of naval warfare. This threat needs to be seriously kept in mind while formulating security policies for the SSCP. It is hoped that the lessons learnt from MCM operations in the Straits of Hormuz during and after “Operation Desert Storm” is not lost on our policy planners." 2. In a perceptive paper presented at an International Symposium in Chennai conducted by the Centre for Security Analysis on 13/14 DEC 2006, Arabinda Acharya & Nadeeka Prashadani Withana from Singapore stated: " The LTTE is the pioneer in maritime terrorism with a state-of-the-art maritime terrorist organization. With its maritime terrorist arm called the "Sea Tigers", LTTE has been successful in destroying a large number of Sri Lankan naval vessels and personnel." Continuing, they further stated: " The LTTE also has an underwater unit which is responsible for infiltrating harbours to lay mines, conducting reconnaissance operations and recovering material from vessels that have been sunk. The Sea Tigers have developed improvised mines from everyday household objects such as rice cookers. Free floating mines have also been used ( eg. inside Trincomalee harbour) which are generally equipped with about 6 horns to prevent accidental detonation while floating. - - -- . In June 2006, 5 Sea Tigers were arrested by Sri Lankan police while laying mines off the shore of Wennappuwa (60 Kms North of Colombo). The mines were a nest type of improvised devices which the authorities believe was developed by the LTTE. The mines were similar to limpet mines and were designed to stick magnetically to the ship's hull. Each mine weighed between 10-15 Kgs and could be triggered to explode by a time-delay fuse or be made to explode remotely." 3. Against the foregoing backdrops, the 'Committee of Eminent Persons', have in their report to the Central Govt. on the section dealing with 'security', have stated in their wisdom: "Unfortunately, the threat by LTTE has been blown beyond the proportion". 4. Please read the report below and judge for yourselves whether the threat perceptions have been 'blown beyond the proportion'!! All it requires to shut down SSCP permanently is 'JUST ONE EXPLOSION'!! COLOMBO: The LTTE said it sunk a Sri Lankan naval vessel early Saturday in a suicide attack where three rebels lost their lives. The Navy however said there was no confrontation with the LTTE and the P438 Fast Attack Craft (FAC) deployed in the north-eastern coastal waters off Nayaru sunk due to a sea mine explosion around 2.00 am. Six crew members of the vessel including the officer-in charge have been rescued and search operation is underway for other survivors, the Navy said. The LTTE said it attacked and sunk the FAC between Mullaithivu and Nayaru. "Three Black Sea Tigers were killed in action," the pro-rebel website Tamilnet quoted LTTE sources in Wanni as saying. However, the navy maintained that no LTTE sea craft was present in the area when its vessel sank. The boat was caught in the explosion of a sea mine "unscrupulously" laid by the LTTE in a bid to avenge repeated losses in the recent past, navy sources said. "The impending consequence (of the blast) was unavoidable peril leaving the crew with no alternative other than abandoning the craft," an official said. "They then got onto life rafts and started drifting and six members of the crew have thereafter been rescued by other boats," he said. Submerged sites and towns as well as ship-wrecks constitute a very important cultural heritage of mankind; which the UNESCO wants the states to explore, list and protect them under a UN convention approved by the U.N. the ICOMOS international committee on underwater cultural heritage (ICUCH) consisting of "Underwater Cultural Heritage". The ILA's Definition on underwater Cultural Heritage includes all underwater traces of human existence, which are of historical or cultural importance including sites, buildings, shipwrecks, together with their archaeological and natural context. The Ram Sethu comes under this category. It is refered to in the Epic Ramayana and in the Puranas. At the site known as Ram Sethu, the natural rock and the 'piles of stone' laid on it have been submerged with the rise in sea level over 5000 years or more. This rise of sea level was not confined to Dvaraka of Mahabharata period in saurashtra. The underwater exploration by Marine Archeology centre (MAC) in NIO Goa along west coast has revealed that the prehistoric ports of Somnath and Prabhas were also submerged as is evident from the submerged channel waylaid for bringing ships and the presence of anchors and mooring stones in it.In the Elephanta Island , the early historic brick structures of 1st century B.C to 3rd century A.D. have been submerged. The Buddhist period port of sopora is also submerged. On the east coast of India, traces of poompuhar port town have been found in the sea as well as intertidal zone. The rock of Ram Sethu must have been in the intertidal zone and stones must have been piled up to enable the army to cross the sea easily. Over thousands of years small size stone blocks of bridges must have been transported by waves and currents. The frequent textual references to Ram Sethu are not to be dismissed as myths. (Mr.R.Subbarayalu has compiled two millennium old references found in Tamil literature in a 200 page book 'Sethu Bandhanam'). Even the submergence of Dvaraka was considered a myth until the buildings were discovered. The national institute of Oceanography in cooperation with ASI should be asked to undertake the survey listing and protection of important underwater sites and shipwrecks. This works must be undertaken by the Government of India and State Governments as laid down in UN Convention on Protection of Underwater cultural heritage. Ram Sethu must not be damaged but saved and protected. The MAC had initiated certain steps for survey and listing of underwater cultural Heritage of India and even published a tentative map showing shipwrecks sites and submerged parts. Before further damage is done by nature and men to this vast underwater heritage of India, immediate survey listing of Sites with a brief note on each wreck or site should be done , giving highest priority to Ram Sethu.